Welcome to this interactive resource for technical and practical advice on malaria and malaria control for the private sector working in the Asia-Pacific. Here we guide you to find solutions relevant to your company, your context and your needs – answering any background questions you may have along the way by directing you to the range of technical information gathered here on malaria and malaria control. We hope that this resource will raise understanding of the potential impact – both human and financial - that malaria may have on your company as well as the impact – both positive and negative – that your companies’ operations may have on malaria. Armed with this information this website will help you understand all your options for addressing problems, or for getting more involved in combating malaria in the region. Whilst company activities can sometimes increase malaria transmission, more and more private companies are making serious contributions to combatting the disease. This website showcases a number of the programmes making a difference to malaria control looking at why they got involved, what they have achieved and how they did it. Our hope is that other companies will use this resource to begin to explore options to expand their involvement in malaria control, be it through joining business coalitions, or building on the ground malaria control projects. This website is primarily an interactive tool to help private company personnel find solutions to their malaria related questions and to raise understanding about the potential impact of malaria on the company, and the potential for getting involved in combatting malaria, both within and outside ‘the fence’. An important aim of this website is to showcase some of the successful ways in which the private sector has supported malaria control in the Asia-Pacific. In so doing, we hope that companies accessing the site will begin to consider ways to expand their involvement in malaria control. With this in mind we present the information and practical advice that will support companies in this. Note: Information provided here, particularly on drugs for chemoprophylaxis and treatment, does not replace the need for one-on-one medical advice. Each individual’s health issues should be considered before decisions on chemoprophylaxis options or on clinical management are taken. We expect that the personnel who will find this most useful will be site-/asset-level General Managers and corporate Environmental Health and Safety and Social Performance Managers. Head Quarters staff outside the region may also find it useful to understand the potential for company involvement in malaria, and the potential problems that malaria may cause to assets within malarious areas. What do we mean by the Asia-Pacific? 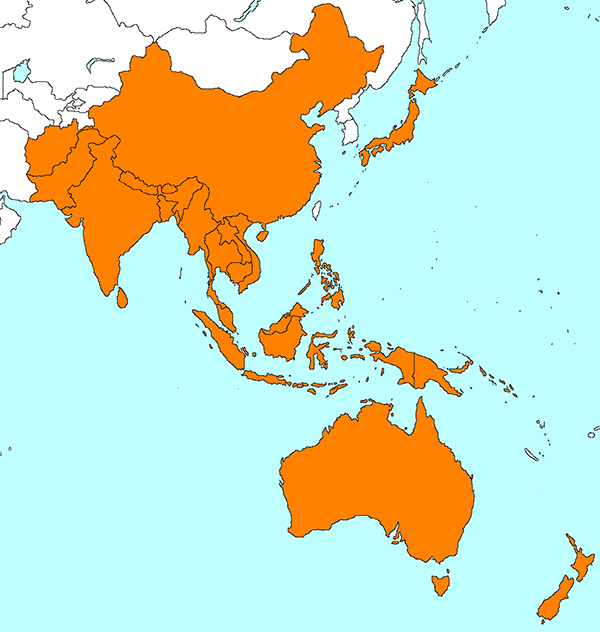 For the purposes of this website, we define the Asia Pacific region as including: Afghanistan, Australia, Bangladesh, Bhutan, Brunei, Cambodia, China, East Timor, India, Indonesia, Japan, Laos, Malaysia, Myanmar, Nepal, New Zealand, North Korea, Pakistan, Papua New Guinea, Philippines, Singapore, Solomon Islands, South Korea, Sri Lanka, Thailand, Vanuatu and Vietnam. Some nations are non-malarious or malaria free but are included for the sake of completeness and are also represented in maps and tables.